Kris: Drinking this lager takes me back to drinking it in some amazing bars in Brooklyn, New York. It is brewed to a pre-prohibition recipe. It has sweet, malty flavour with floral/grassy hop aroma’s and a subtle bitter finish. Perfect with some chicken tacos. Caroline: Me and the Brooklyn Brewery go way back. Nothing like a spring day drinking some lager in the back yard. Fry off 1/2 brown onion (thinly sliced). Add 2 cloves of finely diced garlic, some ground cumin, ground coriander, black pepper, finely chopped coriander root and some sliced red capsicum. 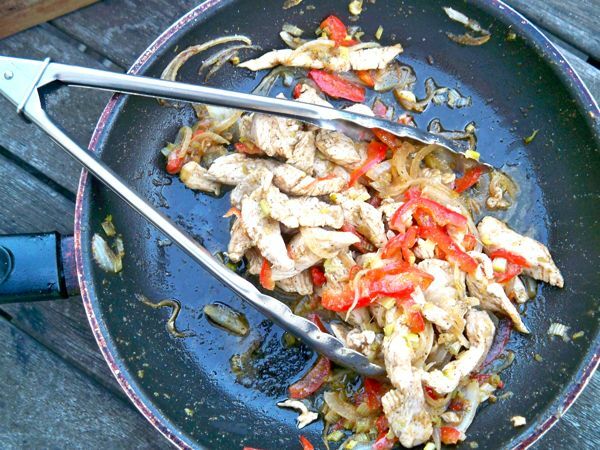 Add sliced chicken breast and brown off. 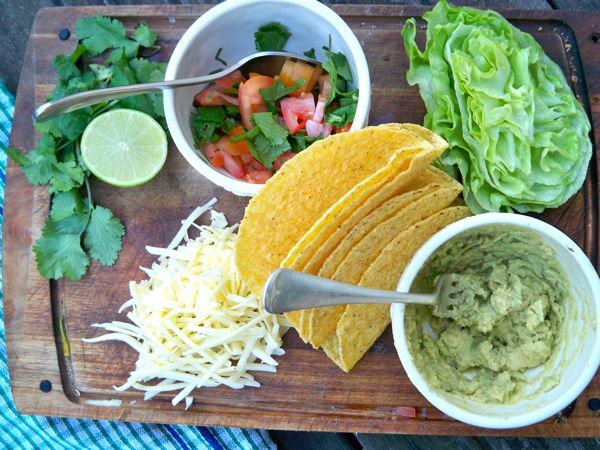 Make a simple guacamole with some mashed avocado, lemon juice, salt and pepper. Also serve with some lettuce and grated cheese. 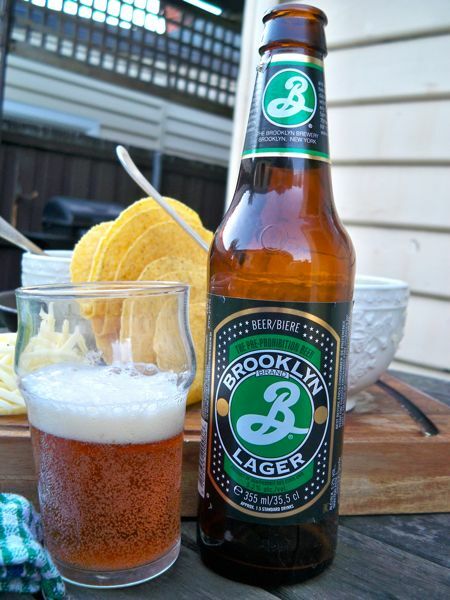 Kris : It is all about simple, fresh flavours, perfectly matched with the Brooklyn Lager. Caroline: Kris, it seems you’ve forgotten the MOST important ingredient! 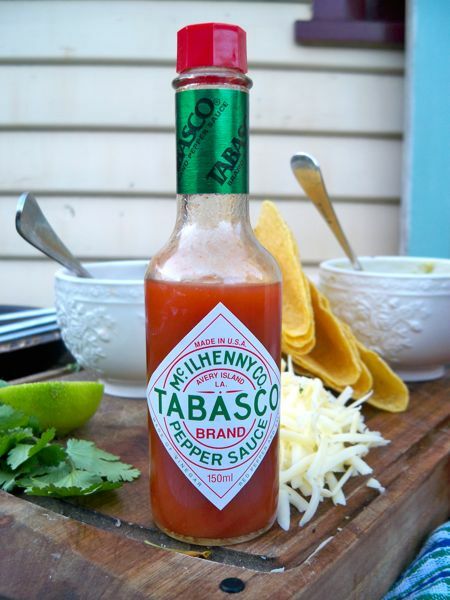 I cannot eat tacos without tabasco sauce! The shells were a bit stale, but hey, they were store bought. After the first taco I just ate the fillings by themselves, still delicious and fresh…one of these days we will think ahead on taco night and make our own tortillas. It was great to be drinking one of my favorite American beers with one of my favorite foods. It was great to have Matt Osbourne from Tasmania’s newest cider venture, Captain Bligh’s, over for dinner last night. We really enjoyed the challenge of matching some Tasmanian ingredients with this amazing new Tasmanian cider. 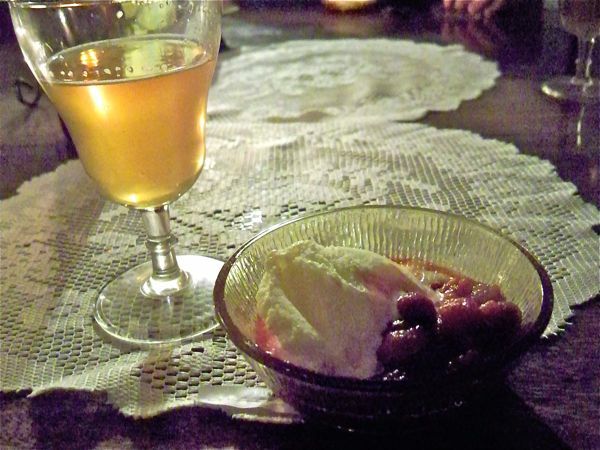 Kris: We had a sample of a couple of batches of the cider before dinner. It is really dry, with a crisp apple aroma and flavour. Perfect for matching with our menu tonight. It’s also a great alternative to a champagne/sparkling wine before a meal, I think particularly with some fresh, natural oysters. Caroline: I loved this cider, Kris is right, it reminds me almost of a wine. This would be a entry cider for those who are mainly wine drinkers. In the past I’ve enjoyed a few ciders but often found them either too sweet or too farm-y (funky) and couldn’t really imagine drinking them with a meal. 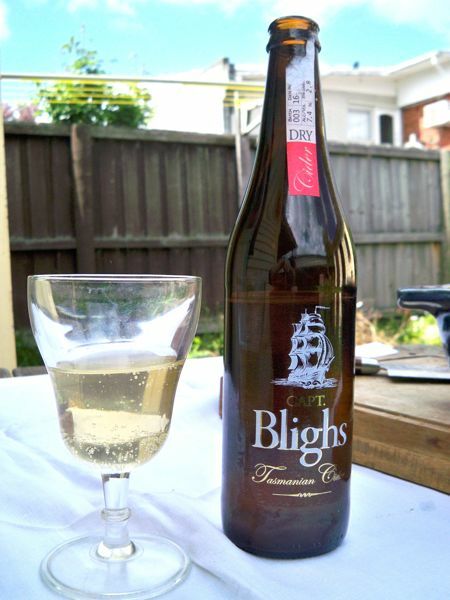 Bligh’s, on the other hand, while tasting distinctively like a cider, wasn’t so overpowering that it would mask over food. It is light and refreshing and I could easily drink this all day by itself as well. Kris: I decided to cook a dish including Tasmanian scallops. It is coming to the end of the scallop season (for wild scallops usually between September and December), which has been really short this year. 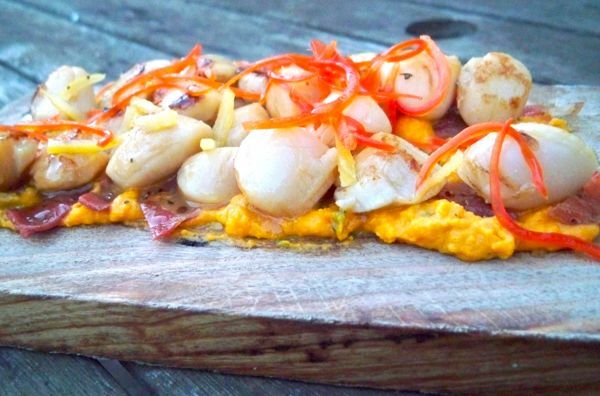 According to Matt, scallops can be a cheap and tasty seafood option and remembers his Grandfather saying they used to be literally, “cheap as chips”. Unfortunately, scallop fisheries are highly unpredictable. This year, for example, scallop beds in the Bass Strait had been left alone for years to replenish only for returning fishers to find they had waited too long; most of the scallops had died of old age and failed to reproduce. You cannot deny the flavour and texture of this fantastic seafood. It was a little bit expensive, but well worth it. When shopping for scallops make sure the flesh is firm, intact, smells slightly of salt water (not fishy), and are slightly transparent. It should also feel a bit sticky (this means they are dry), and not slimy (that may mean they were stored in water or frozen). 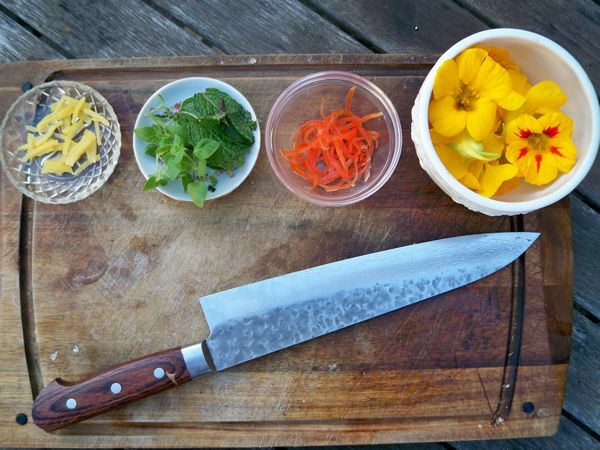 Make a puree of steamed carrots, butter, mint and salt and pepper. Then fried off a piece of proscuitto and cut into small pieces. Heat a frying pan to almost smoking point and cook the scallops for 1-2 mintes on each side. Then pour over a small amount of cider and season with some cracked pepper. Place the puree on the plate, sprinkle over the proscuitto and then lay down the scallops. 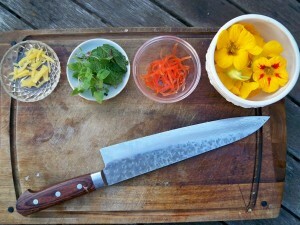 Garnish with julienne (thinly sliced) capsicum and preserved lemon. This dish was a perfect match with the cider! 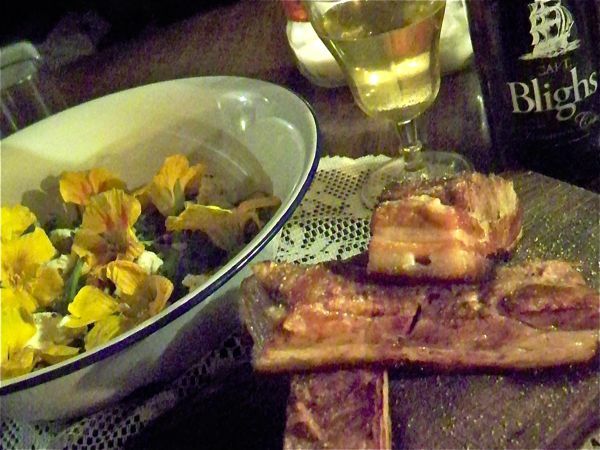 Next on the menu, Free range pork belly slow braised in cider. You need a piece of pork that has enough marbled fat to keep it moist while braising for the first few hours with one side about 3mm thick fat to get that delicious crackling at the end. 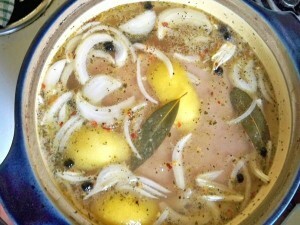 First step is to make the stock you will braise the pork in. Place a sliced small onion, 2 cloves of crushed garlic, some fresh thyme, a couple of bay leaves, some tasmanian pepperberries(or juniper berries), 2-3 pieces of lemon peel, some cracked pepper and 500ml of Bligh’s dry cider in a casserole dish. 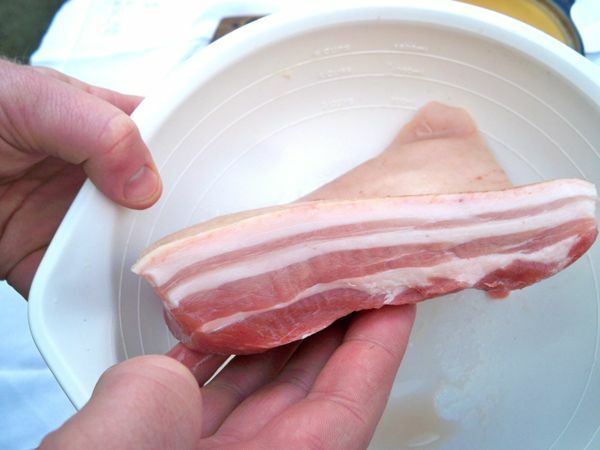 Next, place the pork belly in the stock and cover it with a tight fitting lid or aluminum foil. Make sure the pork is totally submerged. If not add some more cider. Pre heat your oven to 160 degrees and cook the pork for 3 hours. When ready to serve, bring a frying pan to a low to medium heat and cook the pork belly skin side down for 4-5 minutes until it is crispy. Then heat the other side through for another few minutes. Season with some sea salt and let it rest for a few minutes before serving. 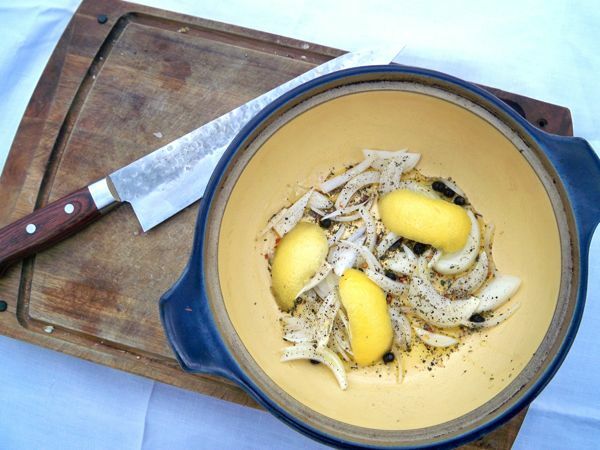 Caroline: The texture of this dish is amazing! The meat is so tender you barely need to cut it, the internal layers of fat melt in your mouth, and the crackling is SO crunchy. Delicious. The sweet citrus-y stock came through and mellowed the salty-fattiness of the meet and matched perfectly with more cider. It really lightened up the meal. 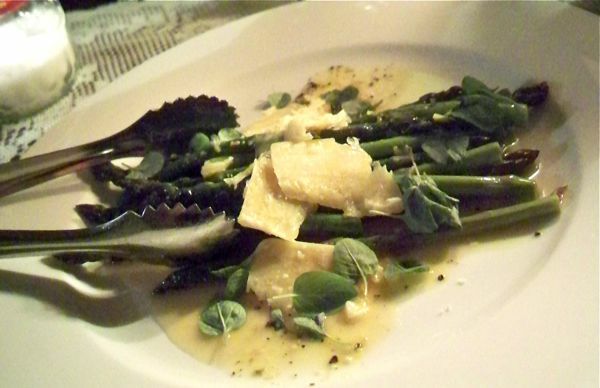 I also made a quick dish with some asparagus, which is in season. I simply pan fried the asparagus in some butter, olive oil and garlic. Right at the end I added a splash of cider and seasoned with salt and pepper. I drizzled over some of the buttery sauce and served it with some parmesan and fresh oregano. It was an awesome spring day, perfect for using some produce out of our backyard garden. I made a really tasty salad to go with the pork. 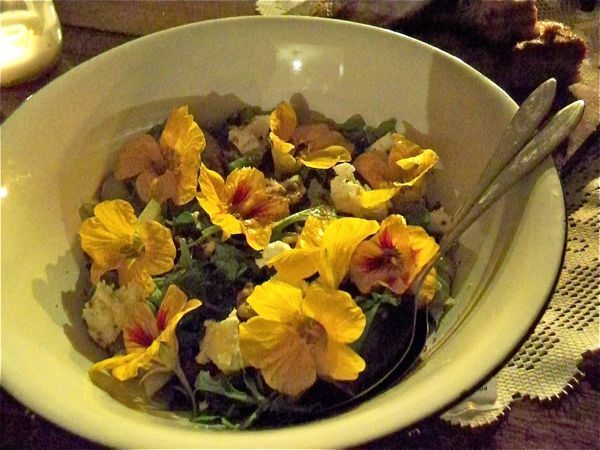 It consisted of baby rocket, thinly sliced pear, some Tasmanian goats chevre, some of the onion removed from the stock that the pork was cooked in, some walnuts and some nasturtium flowers (edible and good looking with a sweet and peppery taste) from the backyard. 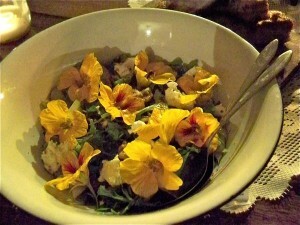 The dressing was a combination of olive oil, cider, lemon juice, honey and mustard. Thanks for coming to dinner Matt! and thanks for the cider, I’m converted!